Along with Yaron Brook (head of the Ayn Rand Institute) and Wafa Sultan (of Al-Jazeera fame), I participated yesterday evening in a panel on "Totalitarian Islam's Threat to the West" at the University of California at Los Angeles. The hall was filled with an audience of 450, with an estimated 200 more outside, unable to enter the auditorium. Some thirty police officers provided airport-style security (including wanding). Despite predictions of a riot, the audience was overwhelming civil and even friendly to the panelists. A disruption began just as I argued for the need to defeat Islamists not just in the battlefields of Afghanistan but also in "the classrooms of UCLA." The disrupters made up a tiny proportion of the audience, perhaps 2 percent, and they found themselves booed and told to "get out" of the hall, which they did. The panel then proceeded, ignoring drumming and other sounds coming from outside the hall. The makeup of the panel was, in my view, particularly good. The three of us agree on the basics but differ on specifics, plus we came from quite distinct vantage points, all of which made for a lively discussion. The Ayn Rand Institute website carries a video of the entire event. 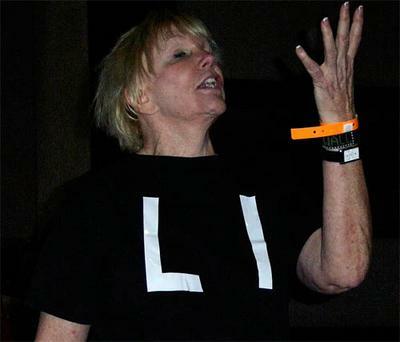 Greta Berlin, who, along with Karin Pally and Mary Hughes Thompson, disrupted the Ayn Rand Institute panel at UCLA. For audience impressions of the event, I recommend (though, contrary to this account, I did not wear a bullet-proof vest) "Exclusive coverage of Drs. Sultan, Pipes, and Brook at UCLA Panel Discussion on Islam with Protests [video/pics]." Infidels are Cool, 13 April 2007. "Report on L.O.G.I.C. 's UCLA panel discussion on totalitarian Islam." Student of Objectivism, 12 April 2007. "Students protest L.O.G.I.C. panel event." The Daily Bruin, 13 April 2007. "Fascists Affirm "Totalitarian Islam's Threat" Revelations of Dr. Daniel Pipes & Psychiatrist Dr. Wafa Sultan at UCLA." Democast TV, 13 April 2007. Contains videos. "UCLA Panel Discussion 4/12/07 - Daniel Pipes and Protests (part 1)." Hecubus, 13 April 2007. Contains interesting photographs. "UCLA Panel Discussion 4/12/07 - Daniel Pipes and Protests (part 2)." Hecubus, 14 April 2007. Contains more good photographs. Aaron Hanscom, "A Threat to Their Own Campus?" Pajamas Media, 19 April 2007. Salomon Hossein disrupts the talk by (partially) unfurling a banner. 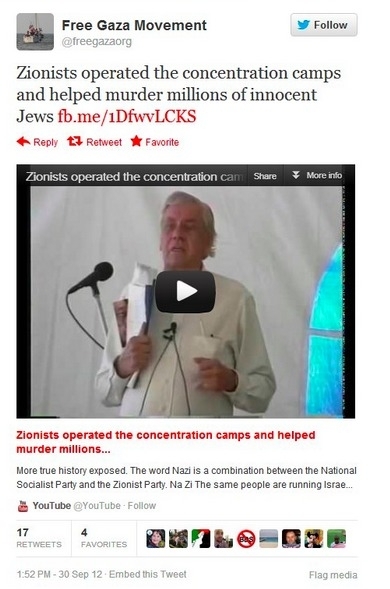 Daniel Pipes sits in the background, to the left. Apr. 15, 2007 update: A student named Salomon Hossein boasts on Facebook "I was on Fox News!" He recounts his exploit: "I had snuck in a big poster ('UC's Don't Support Hate Speech') past 30 cops, L.O.G.I.C. members, and wand-equipped security checking everybody at the door." 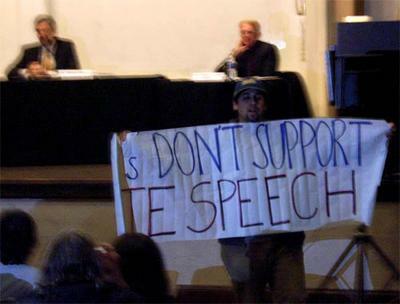 Hossein then provides several pictures of himself looking damn foolish as he held a sign too wide for his arm-span, "s Don't Support te Speech." Comment: I have now identified the four worst disrupters at the event – Greta Berlin, Karin Pally, Mary Hughes Thompson, and Salomon Hossein – and will inform the administration at UCLA of their names and actions, asking for legal action to be taken against them. … I write you about a less pleasant subject – namely the disruption of a panel I participated in on April 12 on the UCLA campus. … You can see my take on the event, plus links to other first-hand reports, including many pictures, at "My Disrupted Talk at UCLA." I identify the four lead disrupters there as Greta Berlin, Karin Pally, Mary Hughes Thompson, and Salomon Hossein. I write to request that the UCLA administration take action against these individuals for disruption. If they are students, they should be suitably punished. If they are not students, they should be charged with trespassing and barred from entering the campus. Chancellor Abrams has asked that I respond to your 4/22/07 e-mail. Thank you for participating in the panel program sponsored by L.O.G.I.C. - one of our 800 student organizations. I understand from your email that you are concerned about four demonstrators who interrupted your presentation. As you know, as a public institution we are committed to creating an open environment which allows for the free exchange of ideas - no matter how controversial. As part of the planning process in advance of this Panel presentation, we set up a very successful security protocol. There were more than four hundred people in the audience. An additional twenty or so protestors were silent and exited quickly without incident. The four who overstepped the program's protocol were removed quickly and handled appropriately by university administrators and police. We are committed to providing a secure environment for civil discourse. We believe this momentary interruption did not constitute a significant interference with your presentation or ensuing discussion. Ultimately, we agree with your assessment of the event on your website; the audience was overwhelmingly civil to the panelists. Despite some initial trepidation, the panel presentation became another example of how divided minds can meet and discuss ideas respectfully. Thank you for contributing to that process. Thank you for your letter of May 1, 2007, concerning the L.O.G.I.C. panel on April 12. In response to your most recent inquiry, "handled appropriately" means that the parties were relocated to a place where they could exercise their 1st Amendment rights without disrupting a scheduled campus event. No charges were brought against any of the individuals. Thank you for your reply to my query about how the disrupters at my April 12 UCLA talk were "handled appropriately." As I think you know, I disagree that relocating the disrupters "to a place where they could exercise their 1st Amendment rights without disrupting a scheduled campus event" – and not charging them – is the appropriate step. Regarding those whom you refer to as "disrupters," the disruption was momentary, and in our judgment, because of that fact was not the type of disruption that warranted disciplinary action. If de minimis infractions were prosecuted in a disciplinary system, the system would quickly break down from overload. We view not prosecuting such cases as an appropriate exercise of prosecutorial discretion. You, of course, are free to disagree. May I also say that we take pride in the fact that on our campus, you were able to speak without any significant interruption. Comment: The UCLA administration considers the disruption on April 12 to be a "de minimis infraction" not worthy of disciplining or punishing, either of the student or the non-students. With this approach, it is formally signaling that such disruptions are fine by it. And so continues the degradation of free speech on campus. what's critical in so many of these incidents is the way college administrations and faculties effectively take the multiculturalist side. If not for that, we could perhaps dismiss some of these incidents as unfortunate excesses by over-enthusiastic students. Yet on campus, "the law" (meaning the power of the faculty and administration) is on the multiculturalists' side, and it's this to which Maloney repeatedly draws our attention..
Incidentally, I appear in Indoctrinate U. May I correctly assume from your correspondence to me that if four persons similarly situated to the "four who overstepped the program's protocol" were to engage in similar behavior, that is, a momentary disruption of a UCLA event (such as, for example, a graduation ceremony or a dinner for UCLA financial contributors), that the University would be of the view that such a disruption would not be of a type that warrants disciplinary action and that the authorities handling of the situation would solely be to relocate the disrupters to a place where they could exercise their First Amendment rights without disrupting the particular scheduled event? I am sending such a letter to Robert Naples today. Nov. 9, 2007 update: For more about Greta Berlin, see the comment to this blog "A Role Model for Peace?" from Ava E. Berlin, who introduces herself as Greta's ex-step-daughter. Oct. 10, 2012 update: If a man is judged by his enemies, I sure have the right ones – fraudsters, extremists, would-be terrorists, conspiracy theorists racists, and overt antisemites. Into the last category add Greta Berlin, co-founder of the Free Gaza Movement and disrupter of my UCLA talk, who on Sep. 30 wrote at the Free Gaza Twitter account that "Zionists operated the concentration camps and helped murder millions of innocent Jews," along with a link to a video by notorious antisemite Eustace Mullins in which he states that Hitler allied with the Zionists "to force anti-Zionists to accept Zionism." The Jerusalem Post reports that Berlin subsequently "issued convoluted and rambling explanations about her tweet, including that the Mullins video was merely meant for a private Facebook discussion group." It quotes her, "I am not a Holocaust denier. And I am not a supporter of the video that I posted, nor would I ever have been." And it quotes me calling Berlin "maliciously deranged."